First off, when you sit on the other side of the car, it means dials and buttons for controlling the car will be situated in different places. In a Japanese car, the windshield wiper controls are on the left of the steering wheel, and the turn signal controls are on the right. You turn your head to the left to check the rearview mirror or look out the back window. When parking, you need to compensate for extra space on the left to avoid scratching your (and someone else's) bumper. And if you drive manual, you're now going to hold the steering wheel with your right hand and shift with your left. Like in the U.S., a quick headlight flash is a common signal between motorists that a patrol car is somewhere nearby. In Japan, flashing with headlights is also commonly used as a signal to "go ahead" to another motorist, such as when you are giving up your rightaway to allow someone else to make a turn. In addition to this, many Japanese will turn on their hazards for a blink or two as a way to say "Thank you" to the driver behind them, and some Japanese even use a very brief honk (it ends up sounding like a chirp) to say "Thanks" to another motorist. In the U.S., I was generally taught to turn into the same lane as the one I'm coming from--that is to say, if I make a right-hand turn at home, I always turn into the right-most lane of the new street. If I make a left-hand turn, I always turn into the left-most lane of the new street. In Japan, this rule does not apply. 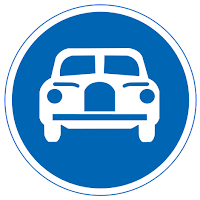 If there is no oncoming traffic and you can confirm that the move will be safe, it is legal to, for example, make a right-hand turn into the far-left lane of a large motorway. In Japan, a white line painted across the road does not necessarily mean you are supposed to stop. 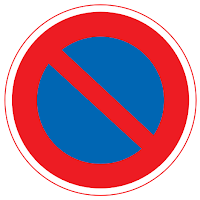 If there isn't an obstruction in the road (such as another car or pedestrians crossing at a crosswalk), a traffic signal, a stop sign, or the word 止まれ (tomare) painted in front of the white line, you are not required to stop. 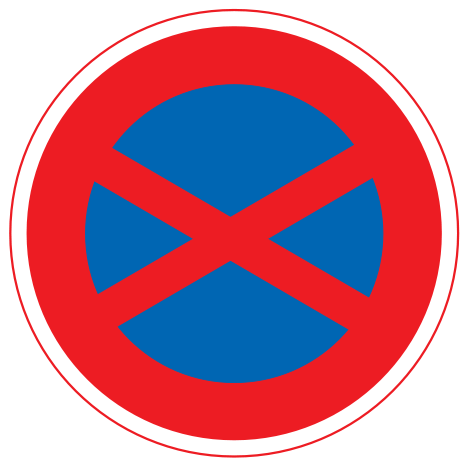 This differs from America, where drivers are generally taught to come to a complete stop at any intersection in which their rightaway is not specifically indicated. When turning at an intersection, often a diamond or a triangle is painted on the road. This is a turning indicator for drivers, and you are supposed to turn the car tightly enough that it doesn't cross over this symbol. In Japan, parking along a road is illegal almost everywhere. This makes sense, because Japanese roads tend to be skinnier than American counterparts. But despite this, Japanese people "temporarily" park along roads all the time, and if you aren't prepared for it, it can be very obnoxious. Drivers will suddenly, without warning, pull over to the side of the road and flip on their hazards to "park" while they run inside a convenience store. But, if the road is too tight, there may not be enough room for you to maneuver around the jerk without bashing into oncoming traffic. On big roads in big cities, I generally avoid the left-most lane unless I'm about to turn in that direction; if you always keep to the left, there is no telling when you'll run up on a vehicle with its hazards flashing and be unable to merge right because of heavy city traffic. On the other hand, Japan's dearth of parking spaces mean that a two-minute roadside stop may be the only way for you to access a store. And, since everyone else is used to it, stopping like this probably won't surprise any Japanese drivers. Just be prudent about where you are stopping and ensure that other drivers are going to be able to squeeze past you without trouble. Finally, always be aware of signage on the road you're on. 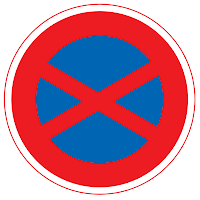 This red 'X' road sign indicates that parking and stopping are illegal on a given road. So, keep these points in mind and drive safe in Japan. If you have any other good tips, please share it with a comment below.